Also, after tonz of requests, I’m thrilled to announce that Sadie Jane gift certificates are now available. Who-hoo! See something you like? Know of something I should add? Gimme’ a shout, shelleywetzel@hotmail.com, I’d love to hear from you. Spring has sprung, which can only mean one thing: Sadie Jane’s is hittin’ the road … well, sort of. It’s craft show season and I’m gearing up for the Old Sorehead Trade Days next weekend (April 4-5) in Stanton. Dubbed the best little show in West Texas, this exhibit brings together some 600-plus booths and attracts more than 30,000 visitors and I am so excited to be taking part! I’ll be there with my latest jewelry designs and custom T-shirts and my fingers (and toes) are crossed that you’ll be there, too. For details on Trade days, shoot me a message at shelleywetzel@hotmail.com. p.s. I'll be adding a slideshow of my current product line soon, so check back with me! I've got your bling. I've got your candles. Now, I've combined the best of both worlds with these handcrafted tealight holders. 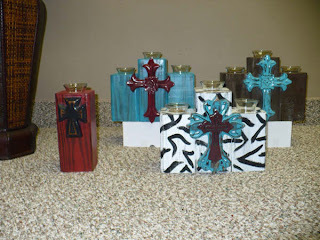 In your choice of one or three tiers, these wooden candle holders boast bold colors and a powerful cross adornment ... perfect for spicing up any space. I'm so excited about this new line of home decor and I can't wait to take your order! Contact me at shelleywetzel@hotmail.com for details. The biz may be called Sadie Jane’s Handmade Jewelry, but as any chica knows, we ladies can not live on jewels alone. ;) That’s why I’m happy to announce that I also carry the yummiest-smelling candles ever. Hand-poured in Stamford, Texas, Cream of the Crop candles are the perfect way to give your house a scentsational feeling of home. I currently carry Lemon Cheesecake, Spiced Cranberry, Cinn-Vanilla and every west Texans’ favorite — leather. Each fantastic scent is available for just $20. Details to come on my new line of T-shirts … stay tuned. Three days ‘til Christmas — Merry! Merry! 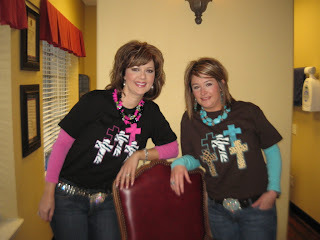 If you're looking for great gift ideas, don't forget about Sadie Jane's Handmade Jewelry. I'm like one of Santa's little elves, cranking out custom pieces. If you're interested in seeing some of my work, please shoot me an e-mail at sadie_jane_jewelry@yahoo.com or shelleywetzel@hotmail.com. Oh, and yay! Mark your calendars, I just booked my next show. In April, I'll be at the Old Sorehead Trade Days in Stanton, Texas. Sooo excited. 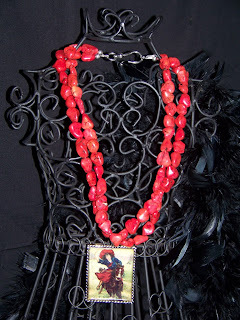 I’ve always loved designing jewelry … the colors, the designs, the creativity! There’s just something so fulfilling about taking a bunch of beads and string and turning them into something beautiful. But, as I’ve only got one neck and two ears with which I can bedeck with my handmade designs, I decided (after seeing much of my jewelry sitting sadly in a box) that I needed to share my passion for funky fashion. So, here I am, launching Sadie Jane’s Handmade Jewelry for all the world to see (buy?? Lol!). Specializing in bold, chunky statement pieces, I have a wide assortment ready and waiting for other jewelry lovers. Interested in seeing some designs? Shoot me an e-mail at sadie_jane_jewelry@yahoo.com (my web site is currently under construction). Until then, enjoy this little sampling.